AdBlue is a solution of high purity urea in demineralised water and is used as an operating fluid in heavy duty diesel engines (>3.5t, > 85kw). This is a direct result of the European Union issuing strict emission standards (EURO 4 in 2005, EURO 5 in 2008). 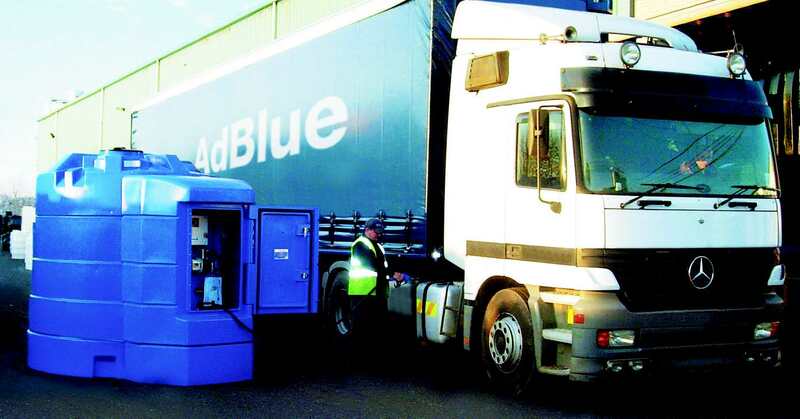 On average, AdBlue is consumed at approximately 3-5% by volume of diesel usage. Meeting the requirements of commercial, industrial and retail outlets, JDP provide a range of fully integrated AdBlue dispensing stations from 500 to 10,000 litre capacity. These fully lockable low maintenance tanks are fully bunded. JDP are also able to provide forecourt models with remote dispensing and metering up to 62,000 litre capacity. Adblue requires specialist containment, must be kept within strictly controlled conditions and stored within Adblue resistant containers. Failure to adhere to these requirements has the potential to destroy the expensive, sophisticated catalytic converters fitted as standard to current generation SCR enabled Euro IV and next generation Euro V commercial vehicles. In the case of an Adblue storage tank serving a fleet of vehicles, an incorrectly specified tank could destroy multiple catalytic converters, invalidate the vehicle manufacturer’s warranty and potentially cost £’000s. Compliant with all ISO, CEFIC and DIBIT requirements.